This article is 2495 days old. Windsor Police have released details as to what caused a massive, multimillion dollar fire at a Dollarama store in the 7600 block of Tecumseh Road East two months ago. Arson investigators had earlier determined that the fire started four feet off the ground in an aisle in the middle of the store and that the circumstances surrounding the start of the fire were “suspicious”. The Windsor Police Service Arson Unit is continuing the investigation into the fire and numerous leads and tips are being followed up on. Windsor Police say the public’s assistance is still being requested. 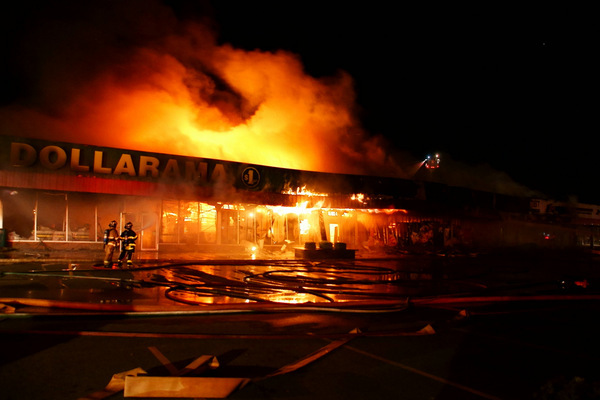 Investigators have received information that not all of the customers inside of the Dollarama at the time of the fire have been identified or come forward. They say it is also possible that customers attending nearby businesses may have witnessed something but may not be aware of its importance. Anyone with any information regarding this arson is asked to call the WPS Arson Unit at 519-255-6700 ext 4330 or anonymously to Crime Stoppers at 519-258-TIPS (8477).